Whenever he sees a veteran of the war in Afghanistan, Frank Culberston is reminded of where he was on Sept. 11, 2001. An encounter earlier this year is a good example. On a trip to Colonial Williamsburg, Virginia to watch the re-enactment of British occupation, he met a young veteran who had lost both legs while serving as an explosive ordinance device technician in Afghanistan. As he helped the soldier, who had two artificial legs, navigate the unpaved grounds, Culbertson mentioned he had witnessed the invasion of Afghanistan from above. "From where, a C-130?" the soldier asked. A C-130 is a low-flying military aircraft used mainly to deliver troops and supplies to ground forces. "Oh, a U-2?" the soldier guessed, referring to the high-altitude reconnaissance aircraft. 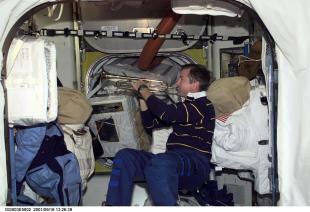 From Aug. 12 to Dec. 15, 2001, astronaut Frank Culbertson was aboard the International Space Station (ISS). Two hundred fifty miles above the Earth's surface, Culbertson was the only American not on the planet at the time of the terrorist attacks. He -- along with two Russian cosmonauts -- witnessed the horrific events of Sept. 11, as well as the invasion of Afghanistan a month later, from space. 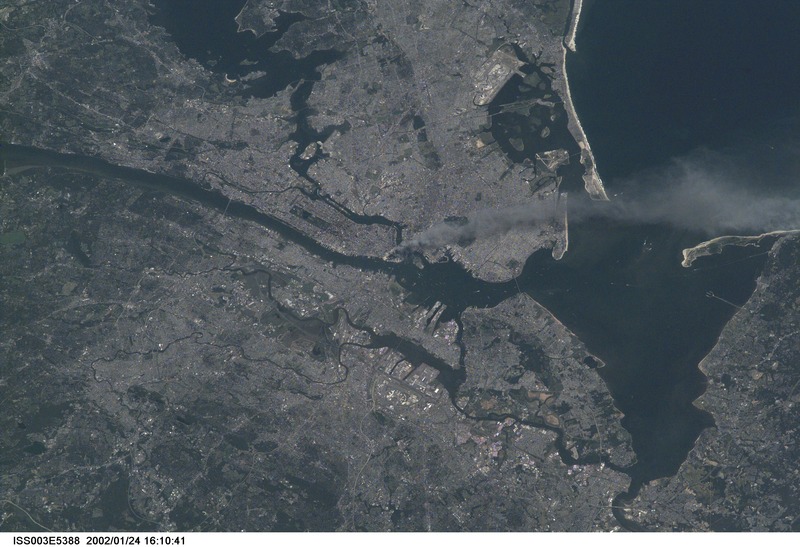 View of New York from space. Photo courtesy of NASA. "I could always spot Afghanistan at night because it's basically dark," said Culbertson, who explained that surrounding countries, with their oil money, were pretty well lit at night. Some were even "grossly lit up," he said. "One night, I looked down on Afghanistan and I saw these big, bright explosions ... I was witnessing the invasion of Afghanistan in pursuit of Osama bin Laden and the Taliban," he said. A graduate of the United States Naval Academy and a former test pilot for the Navy, Culbertson was able to identify what he saw as explosions from cruise missiles and bombs being dropped from B-52s. "After the attacks on 9/11, I knew the world had changed." A month earlier, on the morning of Sept. 11, Culbertson, who had been in space for 30 days, had called down to mission control for a routine medical check-in. "I asked the doctor how things were going. He responded: 'We're not having a very good day on Earth,'" Culbertson recalled. Amid the chaos on the ground, mission control briefed Culbertson on what limited information they had: Two planes had crashed into the World Trade Center towers, and one plane had crashed into the Pentagon; all three were deliberate attacks by terrorists. "My immediate reaction was very visceral: My country was wounded, and it was hurting," Culbertson said. As he listened to mission control, struggling to make sense of the tragedy unfolding hundreds of miles below, he looked up at the map of the world flashing on the computer screen in front of him. In a few minutes, he would be directly over New York. He quickly left the radio, grabbed a video camera and raced to the cabin window that would have the best view of the city. "It was a very good weather day, and I could look down and see the entire northeastern U.S. very clearly. 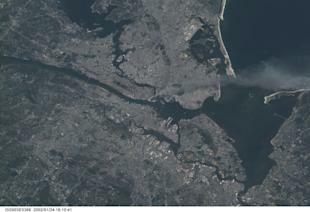 I saw a big column of black smoke rising over New York City, over Long Island, and out over the Atlantic. I zoomed the camera in, and as I did, I saw this big gray glob start to envelop the southern half of the city." He found out two days later that he was witnessing the collapse of the South Tower. Because the International Space Station travels at a speed of about 5 miles per second (it completes its orbit of Earth in only 90 minutes), the views of New York came and went very quickly. Due to the planet's rotation, the next time Culbertson and his crewmates passed over the U.S., they had a view of the Midwest and the Southwest, which was important to Culbertson. A married father of five, he wanted to make sure his family was out of harm's way. "I had a daughter studying at Purdue University at the time, so as we crossed over the Midwest, I'm looking throughout that area to make sure everything's all right over there. Most of the family was in Houston, and I could see all the way down to Texas," he said. As the ISS crossed the Midwest and the mid-Atlantic region came into view, Culbertson and his crewmates were ready with cameras and binoculars. "We flew directly over Washington, D.C., and I could look straight down and see the Pentagon with basically a gash in its side, and the smoke and the lights of the rescue vehicles," he said. "We could tell it was a terrible event." The tragedy at the Pentagon soon became much more personal for Culbertson. The next morning, he found out that a former Naval Academy classmate and good friend, Charles Burlingame, was the captain of American Airlines Flight 77, which had crashed into the building the day before. "Tears don't flow the same in space," said Culbertson in a letter he wrote to the public on Sept. 12. "It's difficult to describe how it feels to be the only American completely off the planet at a time such as this. The feeling that I should be there with all of you, dealing with this, helping in some way, is overwhelming." Culbertson's and Burlingame's 30th college reunion was scheduled to take place at the end of September, and originally Culbertson had planned to send a video message down to his class with joyful greetings and news of his adventures in space. Instead, he played taps on his trumpet in honor of Burlingame, a man who had, decades earlier, played trumpet alongside him in the Navy's Drum and Bugle Corps. Though sorrow tinged his remaining days in space, Culbertson remembers the care poured over him by people from various countries. On a close level, he felt the love and encouragement of his two Russian counterparts, who not only shared their sympathy -- as well as their outrage toward the attackers -- and made Culbertson's favorite dinner (borscht), but also gave him the time he needed to think and to grieve. On a wider scale, Culbertson felt the support of nations around the world. "Over the next few weeks, I spoke to many different people from different countries: Russian mission control, prime ministers, royalty," he said. "They all started their conversations [by] extending their condolences to me and to the rest of the country. There were a lot of sympathetic connections going around the world through the International Space Station, which I thought was a very interesting phenomenon." Now that the U.S. has ended its space shuttle program, 62-year-old Culbertson, who retired from NASA in 2002, has joined the private sector in hopes of continuing the legacy of manned space flight. He currently serves as senior vice president of Orbital Sciences, where he is responsible for the company's human space flight programs. After witnessing the goodwill and the cooperation that took place on a multinational level during his time on the ISS, Culbertson believes that manned space flight projects are important for international diplomacy because they allow nations to work together toward a greater goal. "It's important to continue to use the space program as an example of what can be accomplished on a multinational basis. ... Even though we're 10 years away from 9/11, we haven't resolved the issues; the threat is still very real. We still have to take off our shoes going through airport security. We still have young men and women fighting to maintain our freedom here in this country," he said. Culbertson enjoys talking to young military veterans about Sept. 11, learning about their experiences and discussing the unique vantage point he had from space. Meeting the soldier in Colonial Williamsburg earlier this year was no different. But Culbertson said he was particularly impressed by the young man's maturity and perspective. "He had a very positive outlook for someone who had trouble walking. He told me, 'We've got to work on an international basis to solve all these problems and ring in some peaceful resolutions.' ... I couldn't have agreed more."